Ducks and geese strut their stuff in this collection of copyright free and public domain images for crafters. If you are looking for realistic, whimsical or clip-art style duck or geese images, you are at the right place. Vintage, grunge. 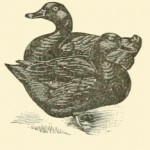 Flying duck drawing from the 1840s. 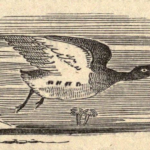 Nice engraving of a duck in flight. Public domain and free to download. 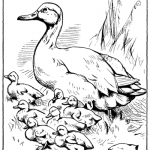 Charming vintage duck image of a mama duck surrounded by her chicks. A great image for coloring, Easter or to add a bit of charm to your projects. A pair of geese feed their gosling. 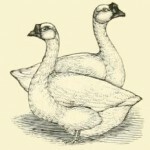 Vintage duck drawing of a pair of Aylesburys. 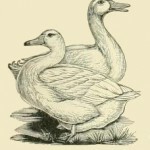 Vintage drawing of a pair of Rouen ducks. 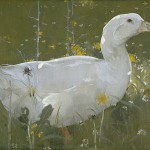 Watercolor and gouache painting of a white duck. 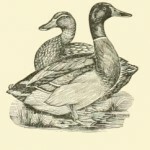 Vintage drawing of a pair of black ducks. 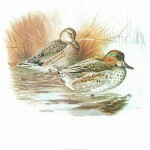 Vintage colored duck drawing of the common teal. 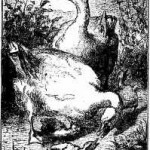 Vintage drawing of Bremen or Embden geese. 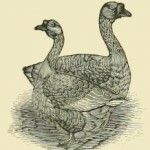 Vintage drawing of a pair of brown Chinese Geese. 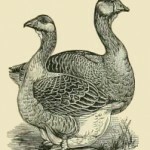 Vintage drawing of a pair of Toulouse Geese. 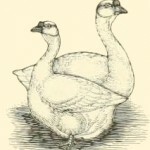 Vintage drawing of a pair of White Chinese geese.